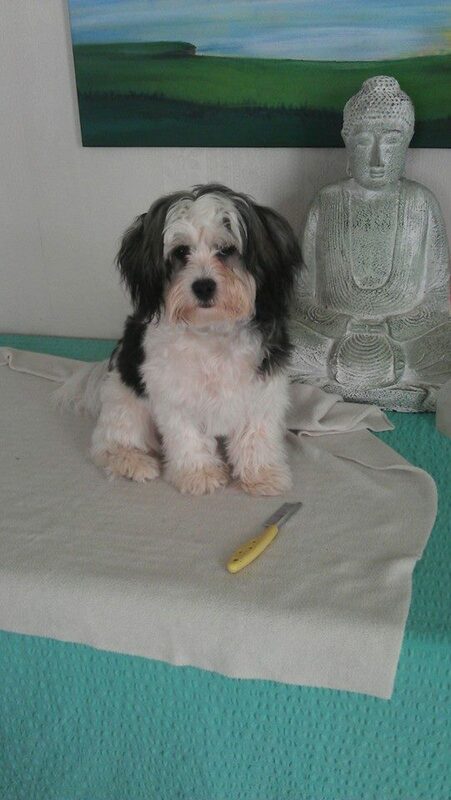 This entry was posted in Daily Life and tagged bath time, Siddy the Shih Tzu X, trimming your puppy's coat, why groomers are good by thecontentedcrafter. Bookmark the permalink. I love that he brought his toys to the tub to be washed. What a clever boy! Siddy has the sweetest face! AND he has a sense of humour! Bless him! He loves to make us laugh – you can see his face light up when that happens. He’s a joy! You must still miss Buddy so much! Do you think you might get another doggie – or would the diva’s not allow that? I was telling Siddy just the other day I cannot remember what life was like without him – the constant companionship, funniness and joy he offers at every moment is just such a gift – except when he chews up something he shouldn’t! LOL, sounds like your morning ritual of snuggles and bounces might be entertaining if not for the fact that Orlando gets squished. Maybe O thinks of the days when the house was all his with fondness, yet enjoys the company of young Siddy at times. Sorry you can’t get to the beach. We’re having rather erratic weather in North America too. Last week we suffered thru an Arctic Vortex with crazy cold and wind. Today was -3C, which now feels very pleasant, LOL. I think they’re now getting the Arctic weather as far south as Texas. The Canadian Farmers Almanac (do you have one for New Zealand?) says this winter will be long and cold. “oh Joy”. I’m sure the farmers do have an almanac of sorts – but I have never seen it. It’s not looking like a good summer again is all I can say! But at least we don’t have to deal with winters like you do either. Everything is changing, we just have to go with it I guess. I understand Mr B being comfortable without a dog – they are such a commitment. But as you say, never say never! O is just fine! I know he doesn’t get much air time these days, but he still rules the roost. He likes to tease Siddy and he knows that when he gets bounced on, Siddy get told to stop which makes Orlando quite happy. O claims his place on furniture, on me and on the bed and Siddy is slowly learning to read when it is okay to bounce and when it is not okay. And I am mostly kept highly amused! 😀 Coming soon to a blog near you – Siddy at the Park……..
Have a great week, Pauline! I don’t remember that piece of information Elaine, so if you did already tell me, it’s good that you repeated it! Were you frightened by a dog as a child? That can be an awful event and if you don’t have friendly dogs around it can become a full blown phobia – I know a couple of people with stories like that. Siddy is the perfect dog to have around people who are unsure about dogs – though he may try to lick you to death! He just loves people and at the dog park runs past dogs to get to their owner and say hello. This sometimes causes issues for the other dog who says ‘Hey, what you doing with my person?’ and they chase him away. It doesn’t seem to bother him at all as he will continue to bound around the person and invite pats at every opportunity. Came by to check up on the newly spiffed up Siddy. Delighted to see that as his hair got shorter your Dangler got longer – can’t wait to see it!! Dangler is finished! 🙂 Currently trying to photograph jolly thing! How are you doing? How many miles? Any miles? Siddy is such a “Big sweetie.” … but looking at those paws, a little pup will soon become a thing of the past. Yes, I agree Frank! I have always suspected he might become a draught horse! Poor Earl! But you see, he had it in hand and didn’t need you two fussing over him. He’s a cleva fella!! I am really hanging out to see these Christmas gifts. I sincerely hope you are going to share with us! I know what you are making and I really need to see it else I shall simply burst! Siddy is a dream to cuddle – he would cuddle lots more if I would only sit still for longer! You have only a month to finish! That is not very long at all – wriggle, wriggle! I’m off to give a talk to a small group now on ‘Living Joyfully’ 🙂 Have a great evening! Pauline, you seriously need to put these into a book! many people would jump for joy to buy this book about Siddy. Siddhartha has always been someone of mythical proportions, (I think) and so is your dog. Worthy of tales of his feats and adventures. Siddy is an imp, a scoundrel, a playful and loving ‘breath of fresh air’ you share with us. Thank you for brightening my day with this epic post. When I sometimes cut my Mom’s dog, Nicki’s hair, I sit on the bathroom floor and put the bathroom trash bin, lined with its bag, by me. I use little scissors and am always saying how pretty she is. I put her on my out-stretched legs and brush, groom and kiss her a lot. There is a little bit of a ‘diva’ in there, she seems to get calmed down while I soothingly talk to her. She is not easily held by my Mom, such a wriggly and ornery girl she is. Siddy, you and daughter were very brave to do this in a high position, since even though Nicki is 11 years old, she seems to be one who would manage to get off the table. The groomer has a harness, which Mom went to see this process, flinched and left with my sister in law, too worried to watch… Your daughter, YD, is beautiful, Pauline. I am proud of your accomplishing your “Dangler” work. I enjoyed the hysterical ritual that Siddy did in the bathroom. He has been such a good liner up of toys, wonder what part of his DNA makes him do this wonderful, entertaining thing? Wise move, to schedule grooming sessions far in advance for next year, Pauline. Hope you have a wonderful weekend! Robin I love your encouragement to put Siddy’s adventures into book form, sadly, I would not know where to start to do such a thing. But I am really happy knowing you enjoy his stories as much as I enjoy living them in the moment. A beautiful retelling of the myth of Prince Siddhartha can be found in Bertolucci’s movie ‘Little Buddha’ from 1993. This remains one of my favourite movies of all time. It was your stories and encouragement Robin, that made us brave enough to have this try at hair cutting – I should have mentioned that in the post and it is quite remiss of me not to have done that! We chose the table as it made it easier to have us both handling him and for movement etc. He really was very good and tried so hard to be still – but my it’s a stressful procedure! I flinched more than once as puppy and scissors came into jerky contact ……… I’m really happy to let my groomer do her excellent job while I go browse a book store or something! Did you see Kerry’s comment about her cat who also lines up toys? Hilarious! I have never seen another pup or cat do this and he has done it for most of his life with me so it must be in his genes 🙂 He did it again last night with the inevitable crash and bang as he gets in with the last toy. I watched as they all got prodded and poked and a little roughed up then patted into order. I wonder if this is his way of being ‘top dog’ somewhere as our hierarchy is Orlando, me, Siddy. It’s a tough life being bottom of the pecking order! It is a charming and adorable habit, wherever his genes brought it to him, Pauline! I had not read Kerry’s comment so glad you pointed this out. This was so cute about her ‘wild’ cat instincts of killing things (in her kitty mind) and lining up the catches! I always appreciate good movie recommendations and will need to get this one to take up when I see my Mom over the holidays. Thank you for “Little Buddha” recommendation. I wrote it on a slip of paper with a continuous movie list, kept in my purse. You are never remiss, since I am not really an instigator! Your daughter probably thought it was a good idea, teamwork and a memory built together, too! Siddy is so adorable! I think that’s very brave of you to attempt the grooming yourselves, and it looks to me like ya’all did a really good job. 🙂 I think the groomers earn every penny, too. I have cats and clipping their claws is too big of an adventure for me. I’m with you on the claw clipping thing – that would be asking just too much both of me and the animal in question! I love YD’s optimism – she will give anything a go and generally makes a really good job of it. Siddy is a pistol! I love this post, his haircut looks fantastic! I think I’m in danger of becoming a dog lover, Pauline. Siddy is gorgeous! So cute, and I love that his name is taken from Siddartha – that’s inspired! Happy to help change your perspective Jenny 🙂 I’m hoping something from his namesake will rub off on him. He’s got the joy part down pat, I’d like to see a little detachment, gentleness, calmness. We’ll know in another two or three years I guess. Well, this totally made me laugh out loud! I have a cat who lines her toys up like that, next to my side of the bed! She carries each one in, making that throat noise cats make when they’ve killed a mouse, drops it, and goes off to get another. The photo of Siddy in the tub makes me want to sneak in in the middle of the night and steal him! That’s a clever cat! I should like to see that 🙂 Years ago we had a wonderful cat who used to bring clumps of grass inside in the middle of the night. He would call to us in that same manner. Call and call until someone responded! Then he would re-enact the hunt with much scampering and head tossing and bits of grass flying about. I was always happy he stuck with grass! A wholehearted thanks from all the Siddy fans out here for this snorty-laugh-worthy post. Many years ago I had notions of being a dog groomer. I offered to groom my friend’s little pup for free to see if I was any good – and that was the end of that! Another career choice scratched off the list. So, I could totally relate to you and YD grooming Siddy, but your results are far better than mine. Just when I thought it was difficult grooming dogs, we had a lady visit the house a few months ago to groom Oscar – the CAT! Goodness me! Now that’s a tough way to earn a living! I cannot even imagine being a cat groomer – what a career choice!! Orlando would eat anybody who tried that on him. I only get to do it because I have always done it and there are treats at the end! 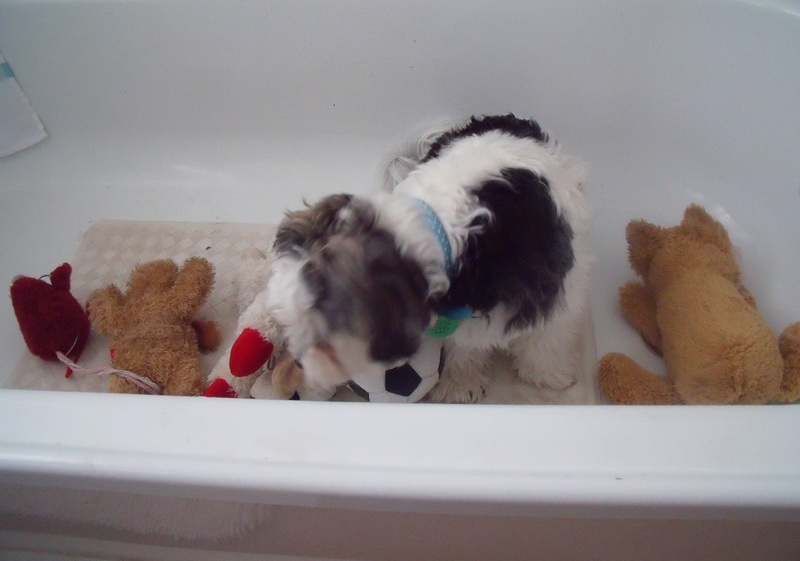 Aw, sweet Siddy in the bathtub with his toys…Priceless. You started my morning out with a smile. Thank you for coming by and please do come again! My goodness you were brave to groom Siddy yourselves. The most I have ever done with Jack is to tidy up his eyebrows, and not successfully. And there is no way he would let me give him a bath…sigh…which is why he has a monthly appointment with groomer and why I can’t afford a haircut for myself! The things we do for love. 🙂 How deliciously funny to find him in the bath with his toys all lined up. Made my day seeing that. The thought of doing anything around the eyes fills me with horror! He jerks his head around so strongly I have difficulty holding him still – I have no idea how groomers do the whole eye and eyebrow cleanup – that bit will just have to stay bushy til the end of February! Lol, yes. It is funny. However, I really must spare some dollars for a trim of my locks. They are getting heavy. Maybe I could do it myself since I am not a big wriggler! Or YD and I can pop by. I will hold you still and she will cut. I have treats! I always take Max to a professional to be groomed – it takes about half the time and is worth every penny. He’s booked in to have a pre-festive season hair do in December (so he’s ready for any parties he might be invited to). I’m so glad to see Siddy enjoying life… what a splendid pup! Alas, Siddy won’t be going to any parties, he can’t see the groomer until the end of February and will have to make do with home cuts until then. He is a splendid pup – you are quite right…… an absolute hoot, he makes me laugh every day! He’ll just be a ‘shabby chic’ pup until February… very trendy! I’d just been thinking that it was time for a blog update, then one appeared! Your fans are grateful!! So much to love and laugh over with this post, but my favorite part was seeing Siddy and his toys in the bath tub! How absolutely fabulous! So glad you got the picture as the story and the image will keep me smiling! Love seeing your daughter and reading about the grooming session. What a fun post!! He is such a doll! I love Siddy and all his clever antics. 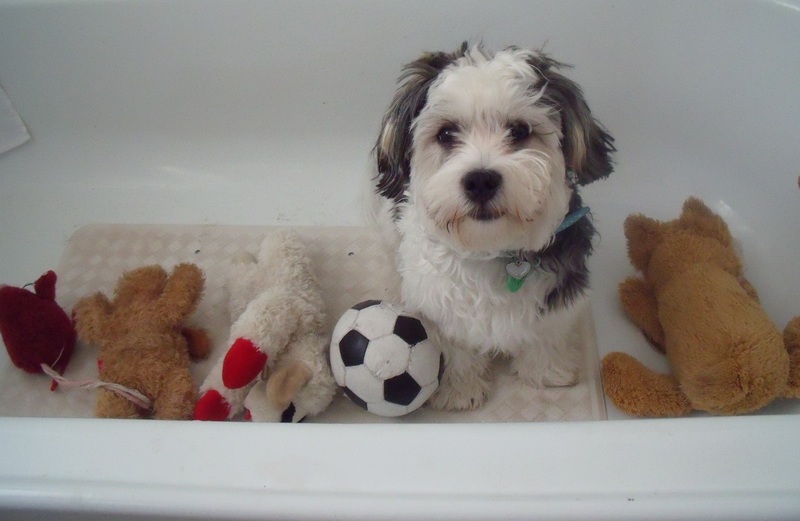 How cute that he lines up his toys, and that he now thought to bring them to the bathtub. I would have roared with laughter too. Congratulations on getting the picture. Well done! You did a nice job on the haircut, but I’m with you: smart to book a professional grooming session and do so in advance. I enjoyed seeing photos of your daughter in this post, and hope to see more in the future. Siddy is one lucky little pup. This boy is an absolute honey! I got so lucky with him Alys – and he chose me too! I’m pretty sure had it been up to me I would have said no at the time. He really has livened things up here and gets me out and about far more than I used to.be. Even Orlando quite likes him 🙂 The toy lining up thing happens quite often, it is just something he does. And to see them and him in the bathtub was truly hilarious! Of course he chose you. He’s no dummy! I love that he chose you and that you are so well suited for each other. Siddy is smart, sweet, clever, funny, and the perfect companion. He’s even won over Orlando, with you as a gentle and patient teacher. Yes, please….more shots, more shots, more shots. I found you through Nancy Hatch’s blog, she suggested I visit and I’m so glad I did. I love your blog after reading all about Siddy’s haircut! 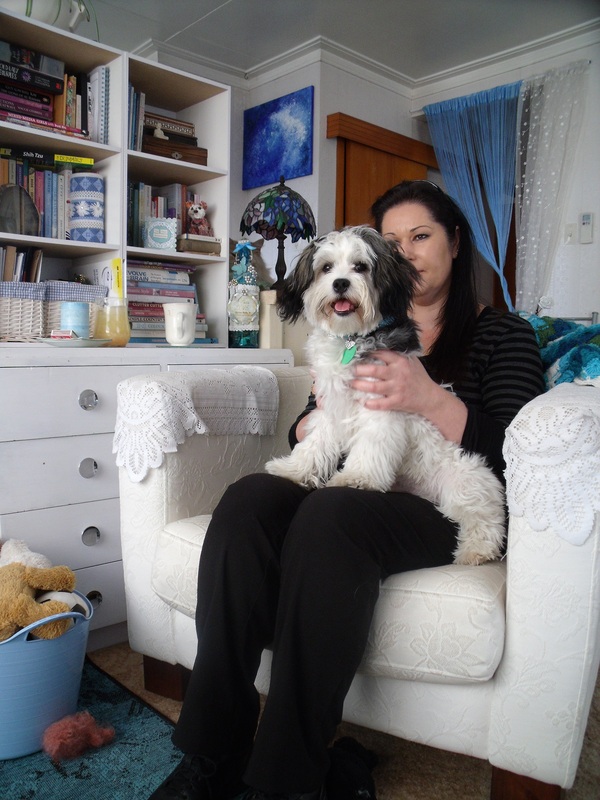 He looks very much like my little Poppy, a grey and white shih-tzu also, go have a look and compare. I think they would get along! Hi Barb, thanks so much for coming by! I popped over and saw your Poppy. There is certainly a close resemblance! 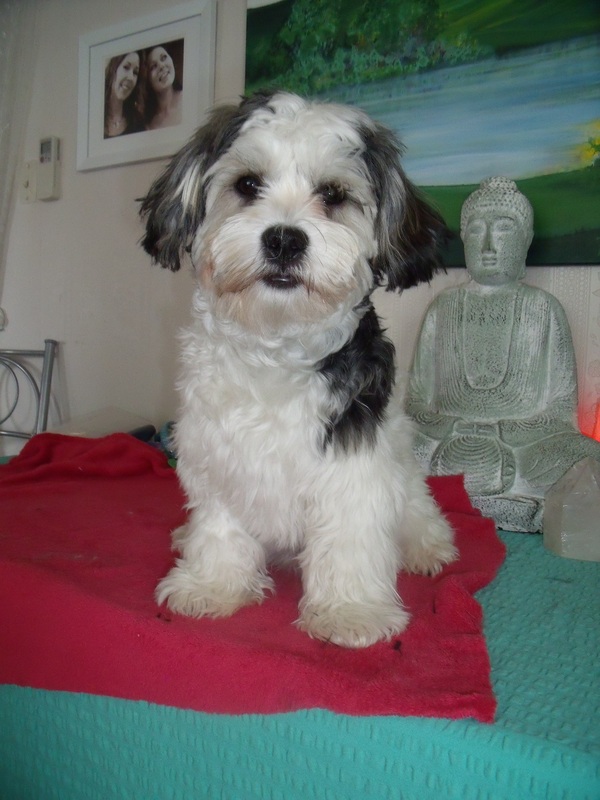 Siddy isn’t a purebred though – he is Shih-Tzu Maltese Terrier crossed with something else – the breeder thought a Lhasa Apso initially. But as he is bigger than any of those dogs, nobody is sure what daddy is any more. Currently my money is on a poodle as he is getting quite big and his legs are growing faster than anything else. I love Siddy. He is just a ball of furry fun, Eating one’s wicker toy chest is his way of telling you that anything wicker and on his level has a limited life span. He is a true little Darling. Mine, Yarn Rascal hates the water, He’d much prefer to rub himself in Pepy le Peu odour than bathe. I tell him he’s living like a wild doggie. But I will bathe and groom him next week so he can be fresh for the holidays. That is so funny. I laughed out loud “..since he learnt to get into the tub he spends quite a bit of time in there.” That is precious. Everyone needs a pet like Siddy + Orlando! LIfe is more interesting + fun with furry roommates!!!! He looks like a stuffed animal you would purchase in a toy store—he is that perfect! He is as soft as he looks – especially when his coat has been trimmed. His fur is fine and soft and curly – he is looking more and more as if there is some poodle in the mix – and he loves to be cuddled and petted and made a fuss of. You would probably become his new BFF if you wandered over for a visit. He adores YD and hangs out waiting for her and goes into an absolute frenzy of delight when she appears! Even Orlando likes him, in small doses. They can be really sweet together until Siddy ruins it by getting too excited, usually ending with him jumping on the back of the poor cat. The lining up of toys is something he does quite often. You can stumble across a line in all kinds of odd places. I have no idea why. That was a laugh out loud post. What a delight Siddy is. It’s worth all the work I’m sure. I’ll be smiling all night thinking of him putting his toys in the tub. I have never seen such a thing. I would bathe mine in between grooming and sometimes trim around the eyes and tail for sanitary reasons. That’s true love you know. Only a mother would do such a thing. The fact that he plays with the dryer is incredible as well. Thanks for the cheer. I think you did a fabulous job with his haircut, but I’m sure it was nail-biting stuff. And LOL at him marching to the tub with muddy paws AND at his relocation of toys from basket to bathroom. What a sweet treat he is. He is a complete hoot Nancy! He is pretty much always busy and very eager to please. He also knows when ‘treats’ are due for being ‘a good boy’. I think he keeps count. Thanks for sending Barbara over too, that was sweet! My pleasure, Pauline. Barb is passionate about pets ~ I knew she’d love to meet your little guy. Looking good on so many levels. Glad to hear the little guy is getting along so well. His hair grows so fast and I really like him looking neat – and you can tell he feels happier too so it’s going to be a bi-monthly expense I shall just have to become happy about. We were completely done-in at the end of it – the tension of making a wrong cut and/or maiming him was always a very real possibility! Can’t wait to see it, it’s such a fun thing to do. I have been waiting for a Siddy fix and you didn’t disappoint, Pauline! Gosh! I just want to squeeze his little face and kiss those chubby paws whenever I see him. He looks so handsome with his cut. Thanks for sharing these wonderful photos. Yay for plugging away on your November Goalfest…good for you! I’ll look forward to the finished piece. The goalfest is nearly complete, I just did another three hours on it and it’s about as done as it is going to get I think. I’ll see what I think in the morning. Oh you must have the cutest damn dog in the world!! (After mine of course, don’t look at me that way boys) How funny to put his toys in the bath! What a character 🙂 I think she did a great job of his clip. When we moved to our remote spot my first two thoughts were “how do I get a haircut” and “oh no how do my dogs get a clip…” I purchased a dog grooming kit and have been clipping them ever since. It takes me a while, with breaks built in for cups of tea and a stretch. I agree, they earn every cent! When we venture back to the big smoke I gladly hand them over to our clipper to “straighten them out”. Does your phone take photos? Much easier to take and carry. Oh yes I only updated to a “smart” phone because my perfectly good old phone didn’t pick up the phone waves in this remote spot. Of course the ones that did were expensive, sigh, but a necessary thing to have when travelling over vast distances… good camera though, so that was a positive.